Last week, I treated two of my favorite friends, who happen to hail from Atlanta, to the just-opened musical version of Gone With The Wind (costing me approximately $330), which I can only describe as one of the funniest laugh-out loud musicals to come along in ages. Only thing is those laughs are purely unintentional. Tomorrow may be another day, but taking in this interminable show will lead you right into it. One must endure more than three and a half long hours to get through the mess created by sociologist and first-time musical creator Margaret Martin's treatment of Margaret Mitchell's epic 1936 novel. Inexplicably, Martin managed to gain permission from Mitchell's estate to transform the source material into a meandering pastiche of so many varied musical styles that you'd be forgiven for thinking you're watching several different intertwining tuners at once. Martin's ill-conceived book and largely inane lyrics seldom rise beyond the wings of a cliché. Most of the worst songs are reserved for the leading characters of Miss Scarlett (Jill Paice was out sick, so I saw the valiant Savannah Stevenson in her place) and her dashing husband Rhett Butler (Darius Danesh, once a runner-up on Britain's version of "American Idol"); Stevenson and Danesh do what they can with the lackluster material, but are eventually done in by it. Surely, these actors must recognize that they've attached themselves to a stinker. Interestingly enough, the best songs of the bunch by far are the tunes sung by the slaves. Indeed, the most rousing, deeply moving song -- which in most musicals would have been reserved for the 11 o'clock number -- is sung near the beginning of Act II by the spirited Jina Burrows as Prissy. Sadly, I can't tell you the name of the number because the $10 programme doesn't even bother to list the song titles (perhaps because the show was whittled down to less than four hours just days before it opened, they didn't have time to print new programmes). This and the other soaring anthemic ballads sung by the tuner's fine black actors -- including a splendid NaTasha Yvette Williams (most recently Sofia in Broadway's The Color Purple) as Mammy -- provide the few stirring moments of the evening. But because this is ostensibly a story about a fancifully conceited and self-absorbed white woman named Scarlett O'Hara, the black storylines never have a real chance of going anywhere. Unfortunately, the rest comes across as a mishmash of high school musicals, bad dinner theatre and a seemingly conscious nod to "Waiting For Guffman." There are all the elements of parody without any shred of satirical irony. With the exceptions noted above, this Gone With The Wind rarely rises to the caliber of what one should reasonably be able to expect from the vaunted, hallowed heights of the prestigious West End. Audiences deserve better. You'd think theatre veteran Trevor Nunn would be able to wade through Martin's musical morass -- after all, he is listed as the show's "adapter," whatever that really means. Instead, he seems to amplify the material's incredulity to an absurd level, never allowing any of the themes or subplots to go anywhere but through the revolving door of a set. Yes, John Napier's ever-revolving set that rarely ever really changes no matter how frequently it's given a whirl is perhaps the best gauge for telling when a month or a year -- or years, for that matter -- has passed since it effectively serves as a revolving door for far too many characters we never have a chance to know or care about. The endless, ultimately irritating narration. Fact is, if I really wanted to read the book, I would have done so on my plane ride to London (or listened to the book on my iPod). I don't need the constant exposition by characters telling me the obvious. Do I really need a narrator to tell me that Miss Scarlett is about to look at herself in the mirror when I can see that for myself, or worse, having the dying soldiers rolling around on the floor suddenly rising up to tell us they're all dying? Did I have fun? Well, yes, but for all the wrong reasons. I found myself laughing when I should have been moved. I couldn't help but think, "So this is what audiences who saw Carrie - The Musical must have thought when they saw that great flopperoo." On a more serious note, simply put, Martin and Nunn fail to deliver a compelling musical that can stand on its own. Their efforts have added nothing to the art of live theatre except endless exposition. So my advice is to save your pounds or dollars and time and invest the $11 or so on Margaret Mitchell's Pulitzer Prize-winning book instead. I'm at work and I had to get up from my desk and compose myself, I was laughing so hard! I'm going to resist the urge to tell you that I knew no good would come of this. I just think that "Gone With the Wind" should stay gone - with the wind. What's up with Trevor Nunn? Has he lost his touch? I'm glad NaTasha Yvette Williams was good. I remember she was really great in "The Color Purple." I do applaud your stamina, and hey, at least you got to see it after it was cut down! Plus, you'll have a great story to tell about a real stinkerooni! I hope my words have been some comfort. Oh Esther, when you spend that kind of money on a show, you have to find the silver linings somehow. I just wish it would have been a better show. But I now am walking away with the conclusion that Trevor Nunn is the most overrated director of the stage in our lifetime. I don't know anybody except the creative team who didn't forecast this show to be a major bomb. You just have to wonder what Trevor Nunn was thinking? Let's hope the other upcoming major London musical- Camille, turns out to be a success. I'm surprised that Cliff was able to sit through it. Oh, there's no such thing as a wasted night in the theater. Sometimes the really bad shows are even more fun to sit through. Some of my "fondest" memories have been sitting through some real unmitigated disasters: Roza, Into the Light, The Pirate Queen, Frankenstein, Big, Jekyll & Hyde, Starlight Express, Victor/Victoria. As I tell my students: ya gotta know what the bad stuff looks like to truly appreciate the good stuff. Chris, I completely agree that there's no wasted night. But if someone is asking me whether or not I'd recommend actually spending $$ on GWTW, I'd have to say no. E, our dear friend may have been squirming during the burning of Atlanta, which consisted of a burning flag and a few knocked down sets. 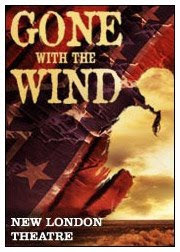 I had the dubious honor of seeing the Japanese-produced production of "Gone With the Wind" back in the 70's. It starred Lesley Ann Warren as Scarlett, Pernell Roberts as Rhett, Udana Powers as Miss Melanie...The performers were strong and fully committed to the epic, as if it were a "Showboat". But it just wasn't the quality of a Jerome Kern epic musical. It was top-heavy, long, and very uninspired. Could this new version you mentioned be related at all to my 70's version? I can understand the temptation of attempting to musicalize GWTW; it just seems to tease you into the belief that it would be wonderful as a musical. I"m even foolish enough to believe that out there lives someone who might even be successful at the attempt. But my memory, as an audience member at the 1975(?) production, is of my constant smirking at the libretto, bracing myself for the song, and suppressing incredible giggle-attacks as the songs went nowhere but to silly or insipid. The highlight of the evening was a song that might have been called, "Bonnie Gone", a sort of spiritual keening for the black servants that was highly repetitive, busy, did nothing to move the show forward and consisted of only two lyrics. But I DO remember it, thirty years later. To this day, if my sister or I say, "Bonnie Gone", I am ready to fall down to my knees and keen or laugh hysterically. These sad shows can be an "honor" (as my friend Richard calls it when he gets to witness a flop) and I agree with the "Broadway & Me" blogger who believes we should be filming these shows on their final weeks for posterity and so the performers might get a better severance pay. Perhaps the DVD version can serve as a cautionary tale to new writers and producers to avoid the mistakes of the past. I will conclude now; I must go finish Act VII of my new musical:War and Peace. Anonymous, Thanks so much for sharing your recollections of the earlier attempt to musicalize this epic work. You brought a smile to my face, just as I'm loving describing to my friends exactly the funniest parts of Gone With The Wind. I'm with you and my friend at Broadway & Me in advocating capturing these shows for posterity. This was one of the best movies I have ever seen!It is pretty long, but it makes you laugh and cry and keeps you hooked till the end.A story of love, passion, tragedy and it has a good historical backround.All in all it was a great movie. Did Cry-Baby Induce Critical Cries of Joy?